What Does Temperature Have to Do With Making Bread Dough Rise? 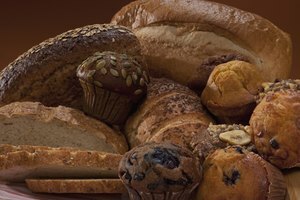 Temperature can affect the rising of bread dough both directly and indirectly. 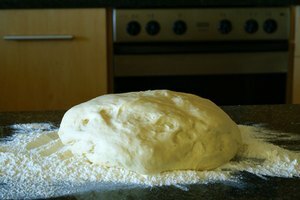 Indirectly, the temperature and atmospheric pressure surrounding the dough will affect how all the ingredients behave, especially the flour. Dry ingredients will absorb wet ingredients more slowly in cold temperatures (the molecules have less energy and so move more slowly themselves), and compounds of ingredients will behave in slightly different ways depending on the variation. This is why some recipes call for different temperatures based on elevation--the pressure affects the ingredients, which is why temperatures must change to compensate. Dough rises because of the yeast present in the ingredients. Yeast, a vital part of making bread, is a mixture of friendly bacterial organisms that feed on the flour. Flour by itself is made from large, simple particles such as starch and sucrose, compounds unable to mix easily with other ingredients. Yeast serves as a catalyst, breaking down flour into different parts and allowing the ingredients to mix together more easily. 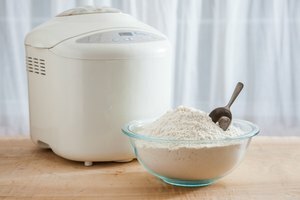 When introduced to the flour, the yeast particles begin feeding on it, creating and using enzymes that break apart the flour particles into different types of sugars. In the process known as fermentation, yeast feeds on the types of sugars it prefers, leaving other sugars untouched and producing small byproducts as a result. These waste materials include alcohol and carbon dioxide. This fermentation and the carbon dioxide it produces is what causes the bread to rise. How much the bread has risen is used as an indication of how much flour the yeast has eaten via the enzymes, and how many simple sugars have been created by the process. 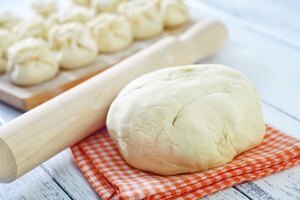 Rising dough can then be seen as an action performed by living organisms, which gives a good indicator of how temperature will affect the process. If the yeast is given moisture and a small amount of sugar to help it get started, it will react much more favorably to the environment and, bolstered by the energy received from the sugar, it will use the moisture to travel more quickly and ferment more of the flour. In a warm environment, the process is even more enhanced, as the metabolism of the yeast is increased and the organisms feel even more comfortable moving and eating. Cold temperatures have the reverse affect. Sensing a more hostile environment, the yeast particles slow their metabolism and consume less of the flour, storing what energy they have and making the fermentation process take much longer. When moved to a warm place again, the yeast in the dough responds accordingly and increases feeding activities. Some types of bread require multiple rising or delayed rising recipes that involve putting the dough in the refrigerator to slow down yeast activity in this way. Dough may be cooled for an hour and then allowed to rise for an hour, or switched back and forth from the refrigerator to the oven at intervals to create particular types of pastry.